876 Series Intelligent Electrochemical Two-wire Transmitters for pH/ORP Contacting Conductivity / Resistivity and Electrodeless Conductivity Measurement. 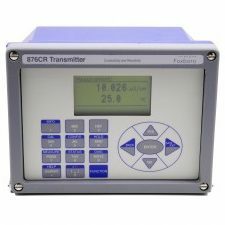 Add the following text: The Foxboro® brand Model 876EC is a 2-wire loop powered intelligent transmitter that, when used with appropriate electrochemical sensors, provides measurement, local display, and transmission of electrodeless conductivity. The transmitter outputs a HART digital signal and a 4 to 20 mA analog output.